Khaled Hosseini's previous book, The Kite Runner, was on the NY Times and Haaretz bestsellers list for over 100 weeks. Khaled Hosseini's previous book, The Kite Runner, was on the NY Times and Haaretz bestsellers list for over 100 weeks. 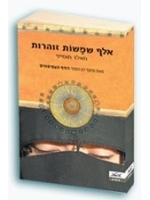 The Hebrew translation of The Kite Runner was a best seller in Israel for many months. Upon its release in Israel, the Hebrew translation of 'A Thousand Splendid Suns,' 'Elef Shemashot Zoharot' also leapt to the number one spot on the Haaretz bestsellers list and is likely to remain in the top ten for quite some time. This is the Hebrew edition of 'A Thousand Splendid Suns,' a breathtaking story set against the volatile events of Afghanistan’s last thirty years—from the Soviet invasion to the reign of the Taliban to the post-Taliban rebuilding—that puts the violence, fear, hope, and faith of this country in intimate, human terms. It is a tale of two generations of characters brought jarringly together by the tragic sweep of war, where personal lives—the struggle to survive, raise a family, find happiness—are inextricable from the history playing out around them.